Losing color is a bad thing. Ask any doctor and they'll tell you that seeing someone as white as a ghost is bad news. Being a conservative, I shy away from liberal buzzwords like "diversity," but diversity is exactly what we continue to lose in American railroading. 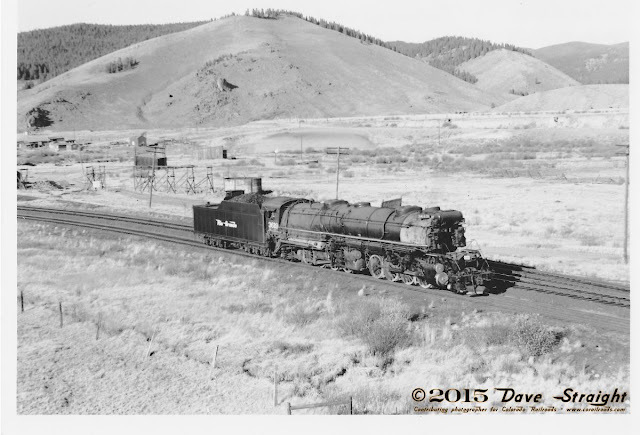 According to ND Holmes of DRGW.net, the last Denver and Rio Grande Western engine with it's original, non UP/SP road number, an SD40 T-2 unit numbered DRGW 5371, is likely going to be patched to a UP road number this month. This will mark the last of the all-Grande, non-Armour yellow-tainted units to pass into history. 5371's sister unit SD40T-2 stands on the ready line at Denver's North Yard on a hot summer day in 1997. Photo (c) 1997 by the author. Even though the unit is currently based in Utah, the significance of this for Colorado is that it is the last of the locomotives that called Colorado and Utah "home." With it's passing, American railroading will become much less colorful. The Rio Grande was the last surviving railroad born in Denver. 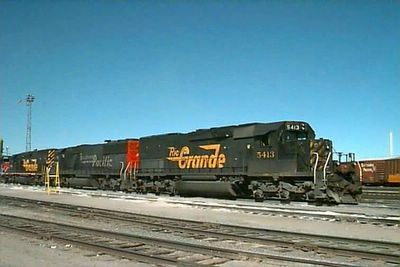 After buying up a larger but cash-strapped Southern Pacific in 1988, Rio Grande under the SP flag fell to the Union Pacific mega-corporation in 1996. Denver-based billionaire Phillip Anschutz sold out to the UP, which was responding to the Burlington Northern merging with the Santa Fe in 1995.  This was the opposite direction of a mid-80's merger that was denied by the Interstate Commerce Commission between the Southern Pacific and the Santa Fe. The Burlington Northern would likely have been bought out by the Union Pacific, but the resulting chain of mergers would have created a monopoly of railroads in too many cities. Before the ICC denied the merger, however, the SP and SF planned to consolidate to one paint scheme of red and yellow, nicknamed Kodachrome after the film packaging of the same color combination. They were painted with letters SP or SF pre-positioned on the engines so that once the merger was official, they could paint the other two beside them to form SPSF. After the denial, SPSF was jokingly referred to "Shouldn't Paint So Fast." After the merger of SP and UP in 1996, the remaining Class 1 (large, main line) roads shrank from five to four with the split-up of the eastern road Conrail. Today, there are two major Class 1 railroads in the east, CSX and Norfolk Southern, and two railroads in the west, the Union Pacific and the Burlington Northern Santa Fe. 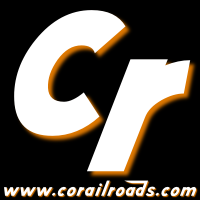 Over 20 years ago in the mid-80's, there were more than 30 Class 1 railroads. Each region of the country had it's own unique splash of color. Santa Fe warbonnets and bluebonnets plied the rails along with Southern Pacific black widows and Kodachromes and, in the east, Chessie's yellow and orange. Each locomotive livery was a source of corporate pride and lended itself to a colorful representation in railroad photography. Today, unless you like BNSF orange, UP yellow, CSX grey or NS black, you're out of luck. A few regional railroads and a smattering of shortlines, which have gone through their own mergers offer the only reprieve from the big four, unless you count Amtrak, which is the eventual destiny of all railroads if these mergers continue. Whenever a corporation merges, it loses unique and colorful aspects of their operation, sometimes with detrimental effects. For example, when UP took over SP's operations in 1997, California, Texas and numerous other western states suffered under a tremendous gridlock. SP's method of operations was completely incompatible with the UP's method and when UP attempted to apply it's method to the SP system, traffic ground to a crawl with trains on sidings abandoned by crews that had spent 12 hours waiting to get into a railroad yard. If trains were it's circulatory system, UP was literally having a heart attack. It's recovery from this ordeal took years. and not a few shippers were lost to other transportation companies, mostly over-the-road trucking. Sometimes, more isn't always better. Sometimes more is just more. While the trend of business is to merge and become more powerful, the ability of clients to utilize competition to their advantage will dwindle. Local industries and businesses will suffer rising costs, passing them on in one form or another to the consumer. Likewise, local uniqueness and color will fade to globalization. This is the way of things, but it doesn't mean I have to like it.